This is a great HAND-SIGNED new copy of How 32 Ways to Be a Champion in Business! You could own this book that has been authentically autographed by this incredible athlete & author. 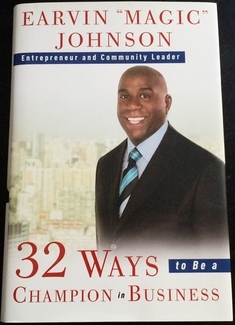 We never sell copies or reproductions of any kind; this book has been hand-signed by Earvin "Magic" Johnson. This book was signed in-person at Borders Books in Penn Plaza in New York City on November 22, 2008.